In Fire and Ice, Nancy, a kindhearted woman, marries her high school sweetheart, Tom. As a big recession hits, she has to overcome so many obstacles from abusive relationship, financial down turn, to being betrayed. Nancy came from a divorced home.When she married her high school sweetheart she expected to have a happy life. Her husband Tom was not what she expected. He was abusive and a heavy drinker.The recession is putting a heavy toll on the relationship and to make matters worse, Tom's parents do not like Nancy. I really felt for Nancy who deals with all these issues on a way to self discovery. I connected with her when she had to deal with trying to keep the family afloat and work with her relationship when Tom who was having a negative effect on her life. Nancy became my hero and will resonate with readers everywhere.I rated this 5 stars and it is well worth the read. Fire and Ice is a must read, whether in a controlling and abusive relationship or not, Dianna Bellarose,s book, gives woman the skills and strength , to not to accept the unacceptable. It's never too late to start over. It is our birth right to be Happy, and to be treated with respect. Thankyou Diana Bellarose for writing this Amazing Novel! 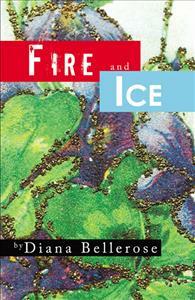 Fire and Ice is an authentic look at two serious problems, spousal abuse and alcoholism. The books straight forward narrative style makes Nancy and Tom’s story poignant and her anguish convincing. It spares the reader the graphic details of the violence undermining the relationship without sacrificing it as the root cause of the problem. Dianna chose to focus on the day to day trauma people living with alcoholism and abuse experience and her book is a better read for it. Fire and Ice concludes leaving the reader with hope, understanding there are solutions to a destructive relationship if you have the courage and will to pursue them. This harrowing story caught my attention from the start. My heart ached for this woman and her daughter. Abuse is abuse and it doesn't matter if there is a marriage certificate that comes along with it. There is nothing worse than staying in a bad relationship. Trying to depend on your own happiness through someone else can be a never ending battle. There comes a time when you have to take responsibility and find it on your own. This emotional story felt realistic and the writing was clear and right to the point. I was hoping for a happy ending that happens in most fairy tales but this was a story about life. Who knows what will happen? Sometimes the puzzle pieces do not fit into place. Fire and Ice is very informative. I think a lot of people could find it very helpful, especially as it concerns understanding domestic and familial abuse and their impact on people.